The variety of our products allows us to address all of our customers’ wishes and offer individualized solutions. 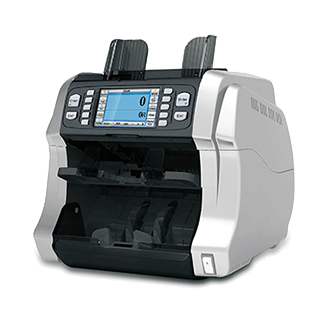 You can for instance choose the JL206F, a fully operational fitness sorter (adhering to ECB regulations) with high repetition accuracy, or the choice might fall on the JL206V, which can be used as a cutting-edge, non-stop value counter and also serves as a fitness sorter (without tape recognition). If only a basic value counter is needed then the JL206GV represents a very cost-effective solution. A variety of sensors and analyzing processes are thoroughly checking each banknote for authenticity and fitness. Soiled or defective banknotes are sorted out and only fit notes are sent to the main pocket. The combination of double-sided recognition via two contact image sensors and wave-length analysis, allows the machine to precisely recognize various security features. Light of different wave-lengths, ranging from ultraviolet to infrared is scanning every note. Information such as value, geometric data, thickness, and security features are analyzed and checked by the internal micro processor. Magnetic features are checked on the banknote’s entire surface area and a unique procedure decodes the security thread. The JL206 examines banknotes with a level of precision that was in the past only achievable by large back-office sorters. The user-friendly touchscreen displays the data in a comprehensive and clear manner and will, through advanced self-diagnosis, keep the user informed on the machine’s status. By following the instructions on screen, unlikely cases such as jams or malfunctions can be alleviated easily. Our portfolio of 12 currencies, spanning around the globe, is continuously expanded upon. Our machines have been processing, among others, Canadian Dollars, Israeli Shekels, and Hong Kong Dollars for many years and have always yielded great results. Julong machines are able to handle the aforementioned currencies with their polymer features without problems.